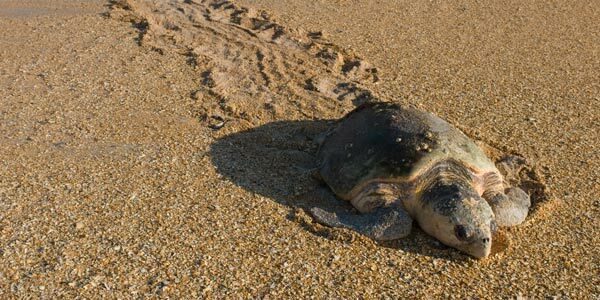 Successful implementation of the Washback Beach Steward program requires coordination, teamwork, and consistency by all involved in marine turtle protection. Zone Captains and Beach Steward volunteers are required to complete the washback program orientation and attend a survey training session. Training will include Habitat Conservation Plan (HCP) and/or Incidental Take Permit (ITP) updates, and any other information SJC needs to provide for successful implementation of the HCP, compliance with the ITP and the Beach Steward volunteer program. Step Two: When you are done take this fun Refresher Quiz as it reports your completion of this year's training to St. Johns County Habitat Conservation Section. Step Three: Complete a Volunteer Application including passing a background screening. August 14, 5:30 to 6:30 p.m. at Surfside Beachfront Park, 3070 Coastal Highway. August 23, 5:30 to 6:30 p.m. at Butler Beachfront Park, 5860 A1A South. August 28, 5:30 to 6:30 p.m. at South Ponte Vedra Recreation Area, 2993 S. Ponte Vedra Blvd. 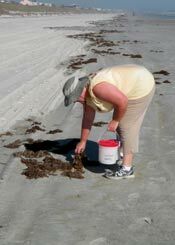 *Please bring a hardcopy of your volunteer application to beach survey training. Zone Captains can print more data sheets or email results to tdodson@sjcfl.us. Weather: It is important that you know what kind of weather to expect during your morning surveys. Tides: It is important that you know what type of tide you will be encountering on your morning surveys. Never push an animal back into the ocean. The animal is either injured or ill and needs medical attention. 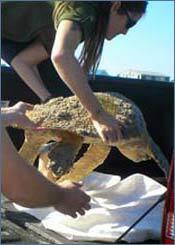 If you are sea turtle patrol volunteer contact your permit holder. This includes whales and dolphins. Interested in volunteering? To find our more please visit the Survey Zones page.